At Nutraferma the goal is clear – to be the global leader in the development of innovative biotech solutions for the feed ingredient industry. Nutraferma’s extensive research efforts have led to unique breakthroughs in the areas of direct-fed microbials, high-value proteins, state-of-the-art yeast products, bio-active peptides and phytogenic additives. Nutraferma is also the pioneer of large scale fermentation. Everyday Nutraferma strives to find innovative biotech solutions for the worlds feed ingredient industry. 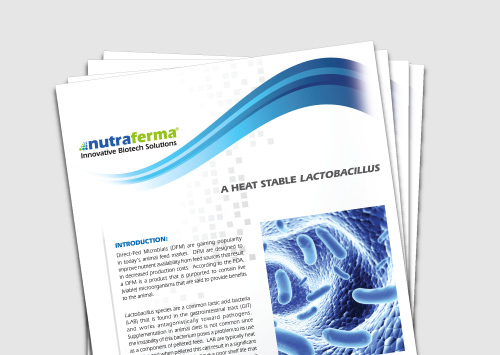 Nutraferma’s unique market perspective has led to the creation of breakthrough products like LactoPlan, with proven efficacy even after pelleting, _Lactobacillus plantarum. _Also products such as PepSoyGen and NF8, the industry’s only state-of-the-art soy-proteins combined with the patented viable microorganisms Pediococcus pentosaceus or Aspergillus oryzae and Bacillus subtilis. Click to contact a sales rep for our white papers and other research. Direct-fed microbials, high-value proteins, state-of-the-art yeast products, bio-active peptides and phytogenic additives. Nutraferma is an innovative biotech solutions company whose research and development efforts have led to patented breakthroughs in the areas of direct-fed microbials, high-value proteins, state-of-the-art yeast products, bioactive peptides, and phytogenic additives. Nutraferma also pioneered the development and use of large-scale solid-state aerobic fermentation. Advanced fermentation technology and patented microbes.